At least 12 Libyan lawmakers resigned on Friday from the interim national parliament as thousands rallied in Tripoli and Benghazi against a move to extend its mandate. The dispute over the General National Congress (GNG) has exposed Libya’s continued fragility nearly three years after the fall of Muammar Qaddafi, with rival camps, many of them armed, lined up for and against the interim parliament. The (GNC) which was elected in 2012 and without popular backing was to end its term on Feb. 7. But members extended its mandate to give a special assembly time to draft a new constitution, seen as a key to stability. 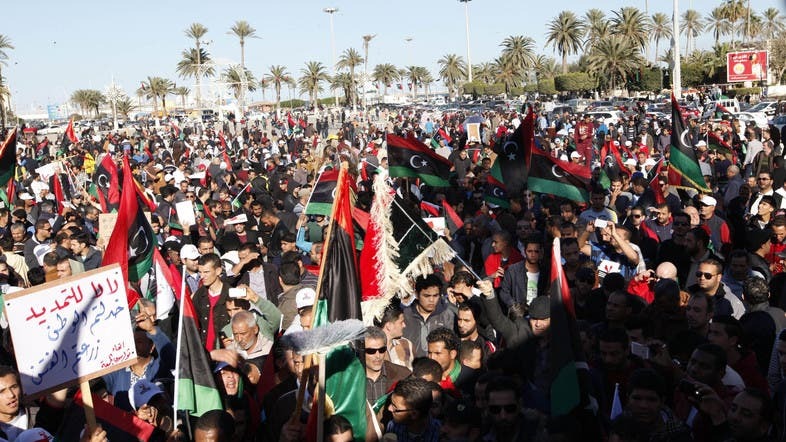 Waving Libyan flags and posters with “No to the extension,” protesters filled Martyrs’ Square in the capital and Main Square in the eastern city of Benghazi in peaceful rallies, Reuters reported. The GNC is deadlocked between the nationalist National Forces Alliance (NFA) and the Justice and Construction Party (JCP), the political arm of the Muslim Brotherhood. “It can’t be any more chaotic or worse than it is now,” said Afifa Ahmed, a human resources worker in Tripoli. “What has the GNC contributed to the country? Nothing,” according to Reuters. Three GNC members, one from the NFA and two independents, said they had resigned on Friday in support of the protesters. With Libya’s democratic transition in crisis, its government weak and its army in training, brigades of former fighters who battled against Gaddafi have allied with competing political factions to become key power brokers. Two rival former militia brigades - the Zintanis and the Misratans - are loosely aligned with the NFA and with the Islamist leadership respectively, increasing risks they may use military muscle to exert political pressure. Militia in the east have blockaded ports and slashed oil exports, Libya’s main revenue lifeline, and security remains fragile, highlighted by Prime Minister Ali Zeidan’s own brief abduction by gunmen last October. Still, Zeidan has managed to survive opponents’ attempts to call a vote of no-confidence in the GNC, mostly due to splits among lawmakers and the lack of a unifying alternative to replace his government. “I urge all citizens to be committed to peaceful means. All demands can be implemented peacefully and through dialogue,” Zeidan said, urging restraint in the GNC standoff. Libya’s messy transition contrasts sharply with its North African neighbor Tunisia, where ruling Islamists have ceded power to a caretaker government to defuse their deadlock with secular opposition parties. That compromise opened the way to finish Tunisia’s new constitution and allow a non-political technocrat cabinet to govern until elections are held around October. Four decades of one-man rule by Gaddafi have left Libyans with little preparation for a smooth transition to democracy. Reflecting the political confusion, many protesters on Friday wanted new elections, but some called for a presidential committee or a high court to replace parliament until elections. After months of squabbling, the GNC agreed on Monday that its would extend its mandate while a 60-member commission would write the new constitution. Elections to choose that commission will be held on February 20. GNC lawmakers say if the commission shows progress in 60 days, they will stay on to assure stability until it finishes. If not, they will hold new elections for a new interim assembly. Highlighting the tense security situation in the capital, unidentified gunmen tried to storm the Libyan army’s command headquarters in Tripoli on Thursday, exchanging gunfire with soldiers before stealing rifles and military vehicles. On a brighter note, Italian and Libyan officials said on Friday two Italian construction workers abducted three weeks ago had been freed. Details of their release were not immediately clear, but the two had been kidnapped in Derna, east of Benghazi, where they had been working at a cement factory.